Based out of San Antonio, Texas, Kyle Lindsey Custom Homes is dedicated to building the best luxury homes in San Antonio and the Hill Country area. Every home is built with the love, dedication and attention to detail that larger builders are unable to provide. Kyle Lindsey, president and CEO, has over 18 years of experience and knows what it’s like to build a home from the ground up. He always personally attends to his customers and their needs. His homes have won various awards, including three Summit Awards, and “The Greenest House” Award. 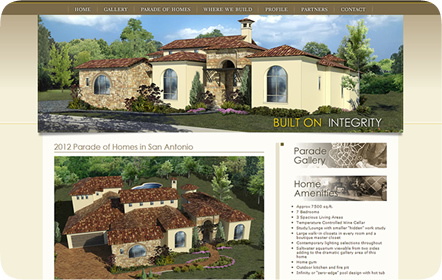 Recently, one of their custom homes located at The Dominion took part of the 2012 Parade of Homes in San Antonio. 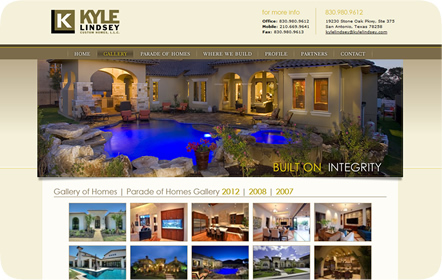 We had built Kyle Lindsey’s original website, so he returned to us looking for an updated website while retaining the same look and feel. Time was of concern, as it had to go live before the 2012 Parade of Homes. 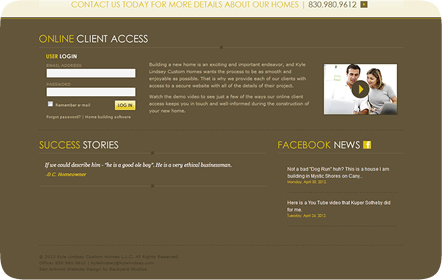 Our focus then became to make the website showcase all of his homes without going past our given deadline. Large, dramatic images and various galleries put Kyle Lindsey’s talent on display. The videos featured on the website let the audience see and experience his homes. The client access we built into the website gives customers the ability to see most recent information about the progress of their homes. The social media we provided also keeps him in touch with both his present and prospective customers. 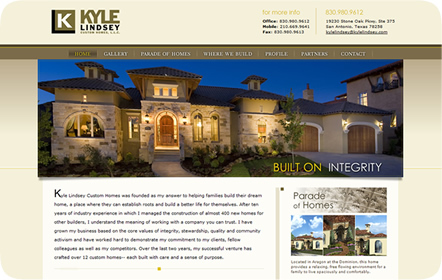 Our SEO has drawn even more customers to his business, as the website is at the top of Google when searching “parade of homes.” Since then, Kyle Lindsey has returned to us to design his business cards which tie into the website.